Capturing those key or unforgettable moments during your wedding isn't a matter of luck. In fact, a true wedding photographer can anticipate these things happening and be prepared for them, sometimes even guiding them into the perfect setup. I had meet Erin and her mom several months before Erin's wedding date. We had discussed several items of importance to them and one of them was a sunset shot, weather permitting. The day had been a warm and muggy, an indication of what we had to look forward to over the coming months. Fortunately, I spent most of the first couple hours indoors with the bride and groom separately. We had created a number of spectacular and emotion-filled images before the ceremony started. And by the time the ceremony ended, I'm not sure there were many people who had any tears left. We worked through the formals at the church before retreating to the country club for the reception. We arrived at the country club with enough time for me to get setup for the introductions and for dinner to be served. As the guests finished eating and the couple mingled among their friends and family, I noticed that were getting close to sunset. 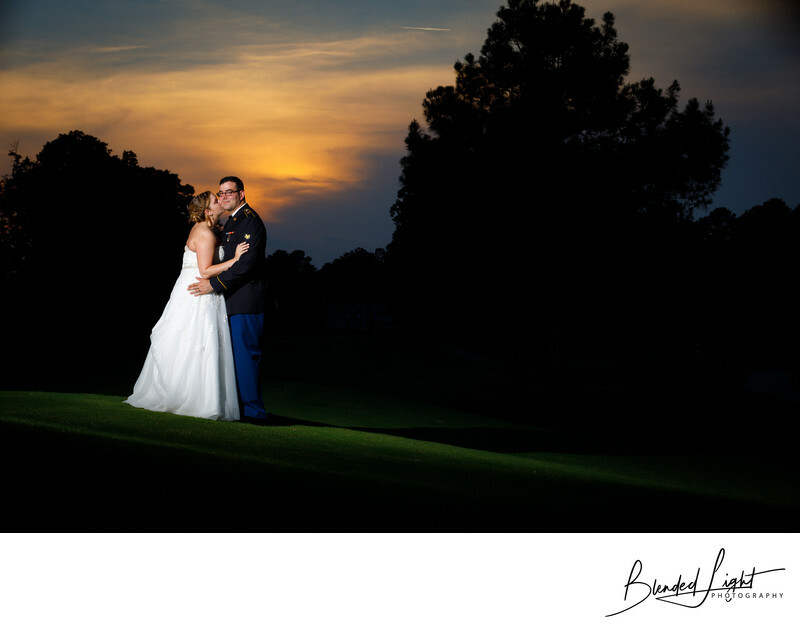 I grabbed a flash and modifier and asked the couple to meet me out on the tee box in about 5 minutes. When they finally had the chance to break away, I knew we were running short on time and sunlight. A couple test shots to dial the flash power in right and we had created the sunset image the bride had really wanted. There's a few ways to create an amazing sunset image. The first is to use natural light for exposure on your couple and then use a sky from another image and blend them in Photoshop. This becomes pretty time consuming with any image that has openings in the trees as the sky has to fill in those areas too for believability. Option number two, similar to the one above, is to make two exposures in back to back and combine them in post-processing. This one is a touch easier, as the light on the couple should match the light coming from the sky, but still a little time consuming because of the detail work required. My preference is to make image. In-camera exposure is set for the sky with flash used to expose the couple. This can sometimes create a darker background, which is sometimes good and sometimes not good. In this image, I followed the first two steps, exposing for the beautiful sunset colors and using flash to light my couple. In this instance, the detail in the background goes really dark, but it's OK as it hides the fairways and the house at the other end without losing anything important. I should clarify this statement. Some are great. Others, well, not so much. To be a great choice for a reception, there's a couple things the club needs to have. First, the area being used has to be private. Nothing more distracting than golfers rolling in the during the middle of the toasts. Secondly, the room needs to have some size. Fortunately, most do as they are also used as ballrooms. Size allows guest and other vendors to move around with ease and have some space to stretch out a little bit. Lastly, it needs to somewhat updated. Country clubs have their own form of decor, generally being a little dated. If the room has been updated with some more modern furniture and lighting, a fresh coat of paint and some windows somewhere, you should be pretty good to go. Regardless of where you choose for your wedding reception, any wedding professional should be able to work under the conditions. If you have your venues picked out, but are still looking for that special photographer, reach out to me and let's see if we will be a good fit together! 1/160; f/7.1; ISO 100; 70.0 mm.